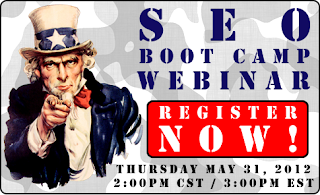 It's SEO Web Design Tips' pleasure to put in a plug for our friends at OIC Group, Inc., who are presenting an incredibly valuable Local SEO Webinar tomorrow Thursday May 31st at 3pm Eastern time. This free webinar will highlight the importance of search engine optimization for local businesses, and will showcase many actionable takeaway points that attendees can employ on their own websites. Tomorrow's local SEO webinar will offer a wealth of insights for attendees in various industries and professions on how to get more traffic to your website. Local SEO Company OIC Group is pulling back the curtains on many "secrets" of the trade, from techniques to optimize your website to ways on how to increase your Google Places ranking. There have been a lot of recent changes taking place in online search. In an effort to provide more relevant, better quality search results, Google has been focusing more on the local orientation of its users. That is, Google is showing localized search results (commonly Google Places) based on the IP addresses of users' locations. These shifts have not only impacted Google's search landscape, but have leveled the playing field. No longer is Google search solely for big-business brands with powerful websites and large local SEO marketing budgets. Now, local businesses can take advantage of an effective advertising and marketing platform that offers a highly targeted way to connect with in-market consumers. To learn actionable tips and strategies that center on local search engine optimization, Google Places SEO, and other Internet marketing channels for local businesses, sign up for OIC Group’s webinar. The webinar is set for tomorrow (Thursday) at 2:00PM CST (3:00PM EST). To sign up for the webinar, click here.